I have to say this one is one of my best recent discovery. I knew nothing of it before, and am wondering why because it's a tremendously well-made movie. That's probably his best film (and that's far from a minority opinion), but most of his output from the mid-50s to the mid-60s is solid at least and sometimes several distinct notches above that. I'm sure David Pirie really liked Stranglers of Bombay and there's a good write up about it in Heritage of Horror, but my copy is easily to hand so I might be confusing it with, e.g. Wheeler Winston Dixon's book on Fisher. Haven't seen Blood Island (or it's sequel) but I think this was one where the novelisation far outstripped the original film and was in print for about 30 years or so. I'd agree with MichaelB on Guest - had I stayed in academia I was planning a research project on him and his films. He was due to come to Brighton in the early 2000s for a screening of Jigsaw, but he couldn't make it (on health grounds IIRC). Dr Amicus wrote: He was due to come to Brighton in the early 2000s for a screening of Jigsaw, but he couldn't make it (on health grounds IIRC). I was at that very screening! And watching it in glorious black-and-white Scope with a large and vocally local audience was a real treat. Yesterday's Enemy was written by Peter R. Newman, who was a longstanding mystery in the relatively exhaustively researched realm of Dr. Who history as someone who had basically just the credit for this one film and one of the very first Doctor Who serials and no one knew who he really was or what happened to him. There's a wonderful feature about him "unraveling" the mystery (it's a far more boring explanation than the setup was probably worth, but it does result in them being able to express to his family for the first time that people still care about his work) on the DVD for that Dr. Who serial, The Sensorites. So that's a point of interest for some that's got me a little more interested in that particular film. Dr Amicus wrote: The only one of Volume 3 I've seen is Yesterday's Enemy which is really interesting - and another example of Guest's impressive use of widescreen. I caught it about 15 years ago at a Hammer day (I think it was the launch for Wayne Kinsey's Bray Studio Years book) in a lovely 35mm print and it looked stunning. IIRC it was a radio play originally - anyone know if it still exists anywhere? I can't see anything on BBC Genome for Yesterday's Enemy as a radio play, but it certainly was a television play, broadcast 14 October 1958 and now lost - incidentally, directed by Chloe Gibson (credited as producer) who may well have been the first woman to direct for the BBC. Given the time, it's quite possible the play was broadcast live and never recorded in the first place. I believe, but I'm not certain, that Peter R. Newman rewrote it as a stage play as well. I too saw the featurette on Newman on the Sensorites DVD that Ribs refers to. Apparently Newman suffered from severe writers' block, which is one reason why Yesterday's Enemy and that Who serial are almost his only IMDB credits. The cause of his death was listed as suicide in some reference books, but the featurette establishes that that was not the case. Mondo Digital on Hammer Volume Three. A wonderfully long and detailed review of The Stranglers of Bombay, courtesy of CineSavant. DVD Beaver on The Stranglers of Bombay. ...and The Terror of the Tongs. ...and The Camp on Blood Island. I didn't release that Yesterday's Enemy was in one of the boxsets. What is the chance of a stand alone release? Same answer as ever with Indicator boxes: once they sell out, and provided they sell out quickly enough. But a standalone edition won’t have the booklet. Mine has just arrived, prompting a rather nerdy question. Two of the disc have LPCM 1.0 soundtracks and two have DTS-HD MA 1.0 (according to my player). What decides which type of soundtrack would be used, especially with films like these, originally released with optical mono soundtracks? Here's an equally nerdy answer - it's to do with the fact that two of the titles (Yesterday's Enemy and The Stranglers of Bombay) are seamlessly branched due to multiple versions being included. Our preference for mono soundtracks is high-bitrate uncompressed LPCM, but with seamlessly branched titles I believe the BD spec requires DTS-HD MA. 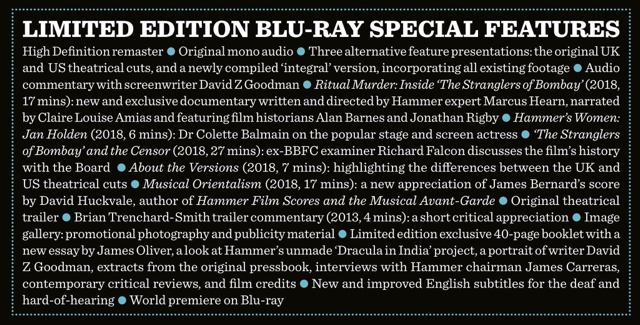 Does anyone know if Indicator plans more volumes in this series of Hammer box sets, once again mining the lesser-known or neglected titles in the the studio's extensive catalog? I think Joseph Losey's unclassifiable hybrid of science-fiction philosophical tale and social issues picture (Oliver Reed leading a gang of leather-jacketed delinquents) The Damned/These Are the Damned would be a prime candidate for an HD edition with lots of interesting extras putting it into a wider context and I am sure there are other worthy candidates outside of Hammer's more famous series. Thanks for the quick reply; I have indeed now located references to it being forthcoming. I suppose it might be in another mixed-genres assortment, which is nice because it brings variety to the offering instead of an all-vampires or an all-dinosaurs box set for example. Not everything in Hammer's back catalogue deserves reissue in such packages, but there are some undeserverdly forgotten titles or oddities that are certainly worth a new look. MichaelB, you may not want to answer this and if so, I understand, but what is the likelihood that future Hammer boxes (particularly ones using potential additional licenses) may be region locked (or partially region locked like the new Castle box)? HitchcockLang wrote: MichaelB, you may not want to answer this and if so, I understand, but what is the likelihood that future Hammer boxes (particularly ones using potential additional licenses) may be region locked (or partially region locked like the new Castle box)? I’m pretty sure volume 4 will be region free. I can’t speak for volume 5 as I don’t know what’s going in it yet.